Something magical occurs when a child who remains indoors goes outside to play. Something amazing happens when a lonely child discovers a friend and delights in companionship. Something great follows when a loving father or mother surprises a child with a gift and the child tastes the goodness of life. 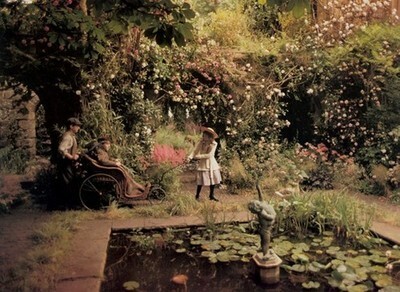 The Secret Garden depicts a fussy, spoiled, indolent, forlorn Mary Lennox deprived of a normal childhood who recovers the magic of play and the wonder of the gift of life. An orphan suddenly transported from India to England to live with her uncle in Yorkshire, Mary changes from pale, sickly child to lively, fun-loving girl when she opens a door and goes outside to play. Her dull spirits and listless mood dissipate when she meets Dickon, a boy who revels in the outdoors and knows “Ants’ ways, beetles’ways, bees’ ways, frogs’ ways, birds’ ways.” Mary’s apathetic nature awakens when Mrs. Sowersby, a mother of twelve children, senses that the child needs to breathe fresh air and sends her the gift of a jump rope. These small changes, however, represent dramatic introductions to larger worlds. They open doors—doors that open to other rooms and places that lead to great discoveries. This is what the children call “the Magic”: life delighting in life as one thing leads to another which leads to another in wild spontaneity. A dull girl with no idea of fun learns to use her imagination. The solitary girl who never left her room discovers pleasures she did not know existed. The girl who never exercised comes to know the exhilaration of jumping with a rope and feeling intensely alive. This child’s opening of one door makes all the difference. T his unlocking of the door lets in the sunshine, the fresh air, the gift of cheerful friends, the beauty of the created world, and the sensation of life as a glorious adventure. Mary’s first observation about Misselthwaite Manor notices the closed nature of the house: “A house with a hundred rooms, nearly all shut up and with their doors locked.” She learns from Ben the gardener about a secret garden with a hidden door and a missing key, and she hears from Martha the maid the history of the garden—the favorite place of Mrs. Craven who died ten years ago when a tree limb fell while she cultivated the garden. No one has entered the garden since the accident. No one has any knowledge of a key to open the door, and Mr. Craven always travels to avoid the sorrow associated with the tragedy of his wife’s loss. Mary learns from Martha, “He won’t let no one go inside. It was her garden. He locked th’ door an’ dug a hole and buried th’ key.” This is another door that piques Mary’s interest in the surprises that await her. Once Mary has been introduced to play with the jump rope, to nature by Dickon’s interest in the butterflies and bees, and to the story about Mrs. Craven and the secret garden, the introspective girl who lived indoors explores the outdoors and notices a universe—a transition that leads to the “four good things” which changed her life: she took a special interest in a robin; “she had run in the wind until her blood had grown warm; she had been healthily hungry for the first time in her life; and she found out what it was to be sorry for someone.” By skipping rope Mary observes the robin that the gardener calls the friendliest of birds. By approaching the bird she sees the robin look for a worm and notices a ring in the dirt that holds “an old key which looked as if it had been buried a long time.” By playing on the moor and breathing its pure air she discovers the wind lifting the ivy from a wall and exposing a door knob hidden with leaves. These four things lead her to another door, one that she can open and enter that leads not only to the secret garden but also “a world all her own”—a garden that the recovers her lost childhood, awakens her imagination, rouses a sense of wonder, makes life a surprising gift, and interests her in the story of another person’s life. A child needs to be introduced to the good and the beautiful which the door to the garden opens; a child needs to be led to experiences and places that enlarge the mind and let it discover “a world” filled with the fascination of the real, a prolific garden with “things runnin’ wild, an’ swingin’ an’ catchin’ hold of each other.” As Mary goes from inside to outside and opens doors, she finds “the magic” that makes her fall in love with life.